This recipe for Honey Mustard Pretzel Chicken has only FIVE simple ingredients. FIVE! I can get dinner on the table in 30 minutes without even needing to go to the grocery store (making this another Millennial Staple Meal). I always have frozen chicken breasts in the freezer, plus honey, dijon mustard, flour, and pretzels in my pantry and you can too - all as part of my Stocking Your Pantry, Fridge, and Freezer guides. This recipe features sweet and tangy homemade honey mustard and crunchy, pretzel-coated chicken. Did you know it's super easy to make your own honey mustard? It's just one part honey to one part dijon mustard! 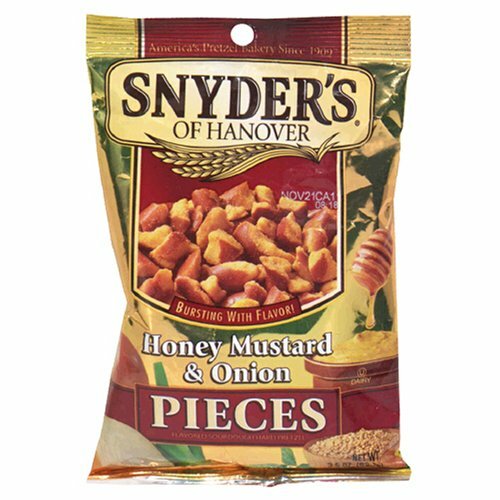 Overall, this recipe is flexible so you can adjust based on what's in your cabinets - you can switch up the kind of mustard you use, buy honey mustard pre-made at the store, and use any kind of pretzel you want, from Pretzel Thins to Snyder's Honey Mustard and Onion Pretzel Pieces for a super explosion of honey mustard flavor. It's a simple recipe, but the flavors are big. Be warned: you'll want to eat your homemade honey mustard sauce with a spoon. 1. Pour 1 cup of flour on a plate. Season with salt & pepper. Stir and spread out so the flour is evenly distributed across the plate. 2. Mix 1/4 cup honey with 1/4 cup dijon mustard. Whisk to combine. Pour half the mixture into a small bowl for dipping sauce later. 3. Crush 2 cups of pretzels - either by sealing in a plastic bag and rolling with a hard object (rolling pin, sturdy glass, etc.) or by pulsing in your blender or food processor. Spread the crushed pretzels out evenly on a plate. 4. Assemble the three stations (flour, honey mustard, and pretzels) so they line up left to right in front of you. 5. Dip the chicken in the flour, coating the entire piece of chicken. 6. Dip the chicken in the honey mustard sauce, coating the entire piece of chicken. 7. Finally, dip the chicken in the pretzel crumbs, flipping over to coat both sides and pressing pretzel crumbs into the chicken to ensure it is completely coated. 8. Heat a bit of oil (canola, vegetable, or olive) in a pan on medium heat. Once heated, place the coated chicken in the pan and cook for ~5 minutes. Flip the chicken over, let cook for another 5 minutes until done. You know the chicken is done when it is no longer pink or translucent in the middle, or when internal temperature reaches 165°F. If you are a meat eater, I highly recommend investing in a meat thermometer to take the guesswork out of cooking - read why at Five Kitchen Essentials for Your First Place. Note: I've experimented with both baking the chicken in the oven and cooking it in a pan on the stovetop. I prefer the stovetop method because 1) it's quicker and 2) it keeps the chicken from drying out. If you wanted to bake it, however, you should place the chicken in the oven at 350°F for approximately 15 minutes, until the chicken reaches an internal temperature of 165°F and is no longer pink or translucent in the middle. 9. When the chicken is done, drizzle with the half of the honey mustard sauce you set aside earlier (not the sauce you used to dip the raw chicken in). Use any extra sauce for dipping! LUNCH TOMORROW - This chicken still tastes awesome the next day, so it wouldn't be a bad idea to make extra and bring it for lunch tomorrow! It's also fun to slice and put on top of a salad - maybe with avocado and bacon like this recipe from Cafe Delites. STORING - Store in an airtight plastic container for 3-4 days. Keep the honey mustard sauce on the side in a separate container if possible, so the chicken doesn't get soggy. EXTRA INGREDIENTS - You'll have extra pretzels but those are super easy to use as a snack by themselves or as a vehicle for enjoying just about any dip, from guac to hummus. Honey and dijon mustard are delicious additions to homemade salad dressings, and honey can be used in almost any sweet recipe you come across as a healthier alternative to refined sugar. This recipe was adapted from the Honey Mustard Pretzel Chicken recipe on Cinnamon Spice and Everything Nice.